Vikram put Betal on his shoulders and started walking. Betal began another story. 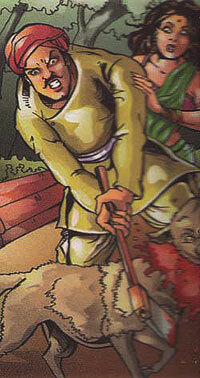 A woodcutter named Mohan once saw a wolf attacking a girl in the forest. He saved her and killed the wolf. She was actually a princess. Mohan was made a soldier in the king's army. Once, in a battle he fought bravely and even saved the king's life. Mohan became famous for his courage. Then he got married and had children. One day, a gang of robbers entered the kingdom and started killing and robbing people. The king asked Mohan to fight the robbers but he refused. Betal said . "Tell me, Vikram , why did he refuse to fight the robbers? Vikram replied , Mohan did not lose his courage, but now that he was a married man, he did not want to risk his life." Betal said, "You are right but you opened your mouth, so here I go." Saying so, Betal flew away.